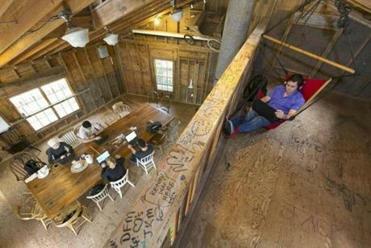 The treehouse on the Epic campus in Verona, Wis., hosts small meetings. VERONA, Wis. — At the end of a long driveway that winds through sprawling meadows and cornfields, a sculpture of a smiling Humpty Dumpty, perched on a wall, beckons visitors into the front door of the health care technology company Epic Systems Corp. It is the first of many unconventional pieces of art here at Epic’s headquarters, where office buildings are designed to mimic Midwestern farms, city subways, tropical forests, and magical castles. Amid these whimsical trappings, in thousands of private offices with doors closed and blinds drawn, youthful programmers in T-shirts and sandals write code for the software that holds medical data for millions of Americans. That code has helped Epic become the dominant provider of electronic medical record systems for doctors and hospitals across the country. Large health systems are spending hundreds of millions of dollars each to adopt what they say is top-shelf software with the potential to improve medical care through better tracking of patient information. 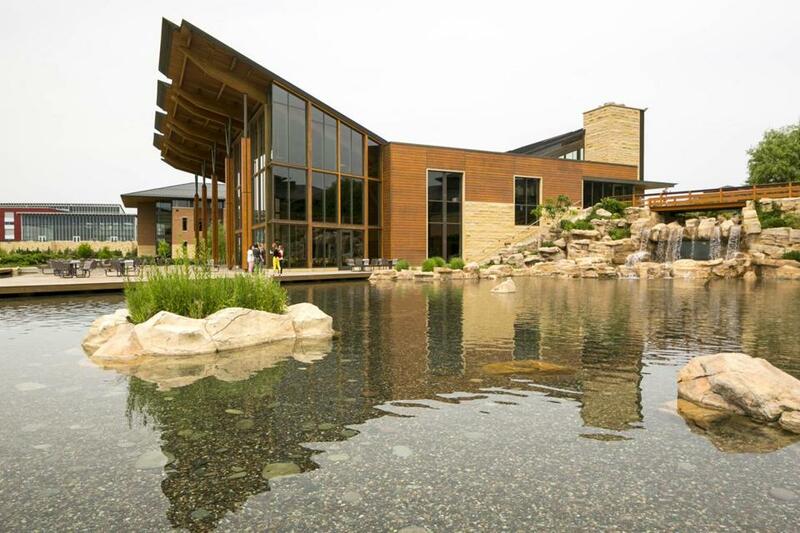 Look inside the sprawling headquarters for Epic Systems Corp. in Verona, Wisconsin. The health care technology company has built workspaces with a sense of fun and creativity in hopes of appealing to young programmers also considering jobs at tech giants. In Massachusetts, Epic’s recent customers include Partners HealthCare, Boston Medical Center, Lahey Health, and, as of this month, UMass Memorial Health Care. Earlier customers included Cambridge Health Alliance and the doctors group Atrius Health. But whether expensive new software will truly improve care remains to be seen. Critics, including health care analysts and Epic’s competitors, say Epic’s products cost too much, rely on outdated technology, and make it difficult for doctors to share patient records across different systems. The company, they say, is selling closed, proprietary systems at a time when technology overall is moving to open, Internet-based applications. “It’s a beautiful relic from another era,” said Jonathan Bush, the chief executive of Watertown-based athenahealth, another maker of electronic health records and medical software. The implementation of Epic’s software is a huge and expensive ordeal requiring large health systems to establish data centers filled with servers, hire hundreds of technology workers, and train thousands of staff. Productivity also declines when hospitals launch the system; they reduce appointments while their workers adjust to the software. Partners hired 600 employees and hundreds of consultants to implement Epic across its network over about five years. The effort will cost $1.2 billion, more than Partners has ever spent on any other project. At Lahey’s flagship hospital in Burlington, the launch went $14 million over budget and contributed to a $21 million financial loss in the first half of the year. Many hospitals select Epic because the brand is well known and the software reliable, said Judy Hanover, a research director at IDC Health Insights in Framingham. And there’s some prestige attached to the Epic name: Renowned health systems like Kaiser Permanente, Mayo Clinic, and Johns Hopkins Medicine have opted for Epic software. But smaller Web-based companies, including athenahealth, are developing newer and more agile programs that soon could become formidable competitors to Epic, Hanover said. An ongoing criticism of Epic’s system is it puts up walls that prevent doctors from sharing records with hospitals and clinics that don’t use Epic software. But the company said it facilitates the sharing of more than 12 million patient records a month across many different systems. Epic was an industry leader in helping hospitals modernize their technology in the pre-Internet age, and, both admirers and critics agree, the company’s growth is impressive, given the vast changes in technology and health care since Epic’s founding in 1979. Judy Faulkner started the company in a basement office in Madison. She never took money from venture capitalists, never merged with or acquired other companies, and never considered going public. These remain key elements to Faulkner’s strategy to run Epic her way. Epic’s success has made Faulkner a billionaire, but she said she still feels more like a mathematician and a computer scientist than a high-flying chief executive. From the beginning of her professional life, Faulkner preferred quiet to noisy offices and working in sweatpants rather than in heels and a skirt. So, in building Epic, she eschewed the open workplace concept and put all her employees in offices. Most employees have a private office; some share one with a colleague. The dress code requires they wear clothes — any clothes. “We’ve never had a violation,” Faulkner said. Epic employs 8,500 people and generated more than $1.7 billion in revenue last year. It doesn’t disclose profits. It continues to expand its corporate campus to make room for hundreds of new hires every year. The company tapped the architects who designed Disneyland to create a sense of fun and creativity that would appeal to young programmers also considering jobs at tech giants like Apple Inc., Google Inc., and Facebook Inc. One part of the campus is a replica of New York’s Grand Central Station. Another is crowded with figures of elephants, giraffes, and other exotic creatures. And, in a nod to Wisconsin’s dairy industry, one section of the campus features a farm theme, with office buildings shaped like barns and sheds. 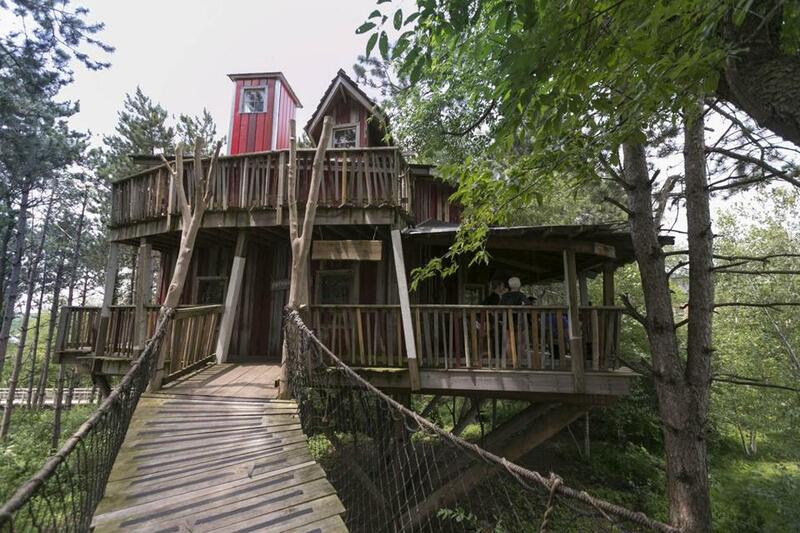 Epic also built a treehouse to host small meetings and an indoor slide — because why not? The rural Wisconsin campus of Epic Systems is designed to create a sense of fun and creativity that would appeal to young programmers.